I had a heck of a time trying to find a decent place to grab a bite while I was visiting Cusco this trip. I was so sick that I couldnt make it much farther than the plaza de armas or the mercado central so I decided to try a taste of home. 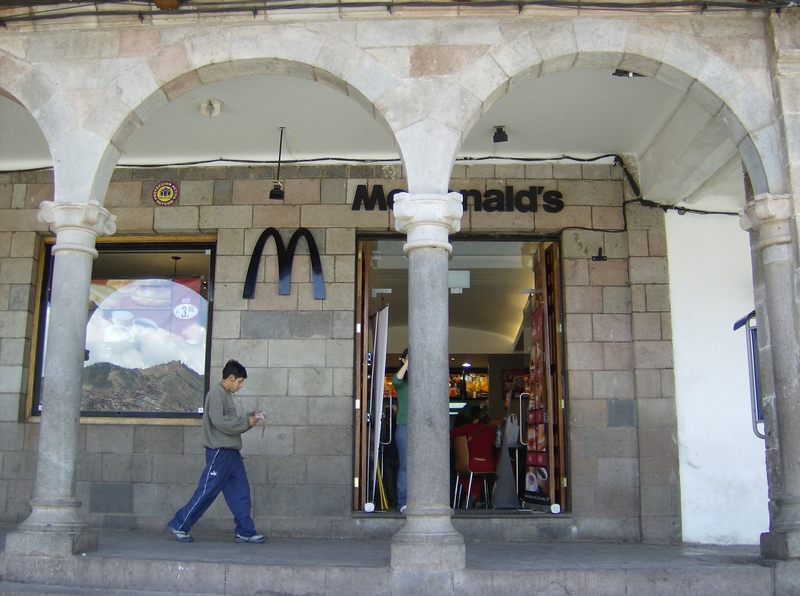 The McDonald’s in Cusco, Peru is located in the Plaza de Armas. They have a restroom and there are plenty of ATM’s and money exchange booths in the plaza close by. The food here is fast and hot as any McDonald’s should be. I just wish I could say the same thing about the local restaurants around Cusco. All I have found that wasnt totally disgusting was Pizza. All the food I tried was bland and tasted of cardboard and week old frozen tv dinners. The only real place to get a meal was in the Market and that was a good deal. Cusco was the Inca Capital. The city is a cultural epicenter and is located at 10,000 feet high in the Andes Mountains. One thing I have always said is that good food is very hard to come by in Cusco. I dont know if that is because of the Altitude Sickness or just that I am used to the complexity of the cuisine in Lima. I have however experienced a great deal of what Cusco has to offer. The Central Market is located close to the San Pedro Rail Station just a few blocks walk from the Plaza de Armas. Here you will find everything from fresh coca leaves to alpaca stocking caps. On any given day you will find a quick and tasty bite to eat here as well. In the mornings locals are quick to grab a fresh glass of custom varieties of fruit juice and freshly made sweet bread. At lunch time it is difficult to find a seat at the favorite spots as the locals all seem to enjoy the eateries. On this particular visit I was overcome with the AMS acute mountain sickness having taken the Flores bus through the night for a non stop 23 hour ride. Let me just say I was glad to be off the bus and I needed to eat. I found a little place in the back with Caldo de chunos or sopa de chunos which seemed perfect. I enjoyed every drop of it for s./1 or about 30 cents usd. It was great and made me feel alot better. There are a variety of alpaca stores and t-shirt shops inside as well as the usual meat market and other various stands of produce. If you are in Cusco you have to check this place out. I recommend trying one of the eateries for a decent meal around lunch time. Away from the internet traveling in remote regions this week. Stay tuned for a complete update!